​The workshop list is out for this year. Simply click the link below to download the file. 2019 workshops are booking out fast. Two days of pastel adventures in the foot hills of Nambour on 8 acres of private property. Day one is for the beginners, those new to pastel or those wanting a kick start to get up to speed again. I will take you through the Six Fundamentals Pastel Strokes and how to make those strokes/mark making count in your very own painting. Day two is for the initiates or practiced plein air painters. No travel is involved we are painting on site. You will see how painting in the great outdoors is not so scary when you have the right tools and ways to go about it. 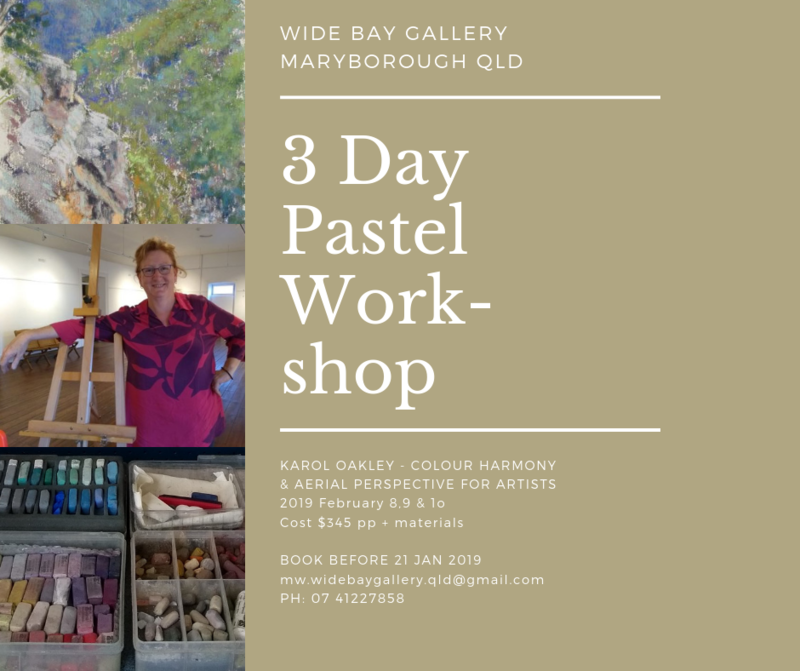 Come and join me for two days of learning and laughter as we have a unique pastel adventure together. Class size is limited to allow for more time with every participant. As an optional and not to be missed extra there is a camp oven dinner on the Saturday night and if your game bring a tent to stay over on site. Karol has over 20 years teaching experience to share with you. She is considered one of the best teachers in this hands on medium. Workshops are tailored for the group. Karol works with each person mentoring them at their skill level and instilling confidence while inspiring participants to go that bit further. A confident and knowledgeable tutor Karol is down to earth and teaches in a relaxed atmosphere, where pastel paintings glow. Would your group would like to book a workshop with Karol in 2019? Haven't got a group? If you can get ten of your friends together I will design a workshop for you. ​ ..........book your workshop now. This plein-air day will start at 9am with a demonstration by Karol while she talks about the best practices for plein-air painting and health and safety considerations. As she demonstrates and talk’s non-stop through that, she will be giving lots of tips and tricks as she paints. Bring a stool/chair and a camera and be ready to ask questions while Karol is demonstrating. After the demonstration, which is time limited to one and a bit hours, everyone finds a view that they want to paint and set up ready to go. Karol will give individual help and equal time with your chosen subject. We have the choice of painting on the surf side in the afternoon and the river side in morning, but there will only be one demonstration. Come and have fun in the great outdoors. Materials List will be sent on booking just let me know you’re coming and I will email it to you. Class size is limited to 10 people. May Sun 13 Close Hahndorf Academy Farewell & Exhibition closure. Pastel Techniques and Tips November 18 & 19 at Crows Nest QLD. Returning to Crows Nest on November 18 and 19 for this two day workshop . Contact me for a link to the bookings. Mon 3 Tue 4 April Pastel Artists of South Australia Pastel "Water, reflections and movement". 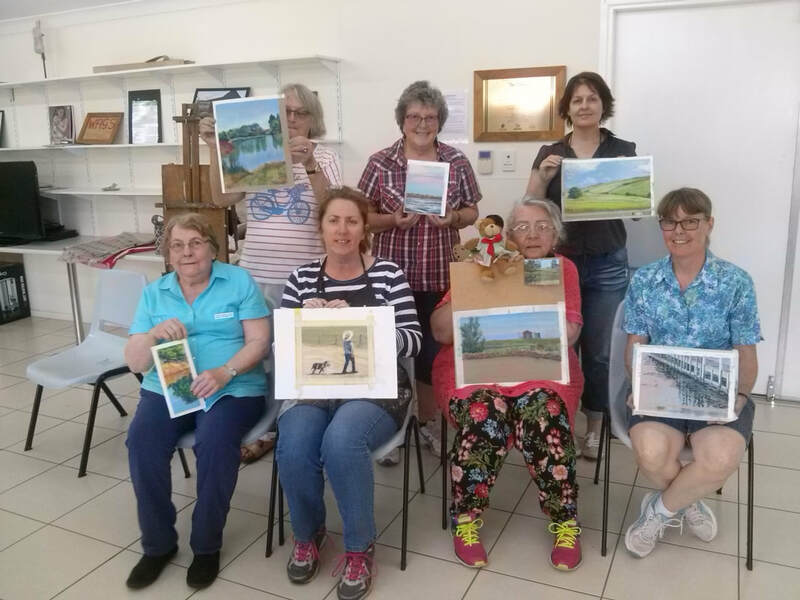 Sat 29 Sun 30 July Pastel Society of Australia Inc Pastel "Using photos for paintings"
Sunday 3 Sept Gold Coast PSA Workshop Pastel "WaterScapes"
Bookings are still available for workshops in pastel. Karol enjoys travelling to teach to rural and remote communities as well as city locations. Please use the contact form by clicking this link to contact Karol about details of workshops here in Australia and overseas. has been cancelled sorry folks. A note for all travelling artists - it seems that bookings and full payment are required 3 months prior to travel to secure airfares and accommodation. So a word for the future, get in early!!! Karol Oakley is returining to Norfolk Island to tutor a fabulous week of painting. One studio day and four paintout days on this dramatic and visually stunning island paradise. Bring a friend as non painting partners are most welcome. Join me as I return to Norfolk Island for my fourth painting tour and holiday on this South Pacific Island. All skill levels are catered for in a relaxed and friendly tutoring enviroment. Below is the Workshop Menu, please scroll through it and email me with any questions you have. Images intended for viewing only and may not be used without permission.